1. Start by applying an eyeshadow primer. 2. 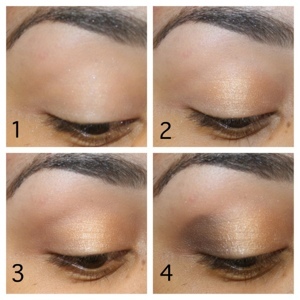 Apply a shimmery gold eyeshadow on 2/3 of your eyelids. 3. Apply a skintone colour on the third part of your lids and blend with a blending brush. 4. 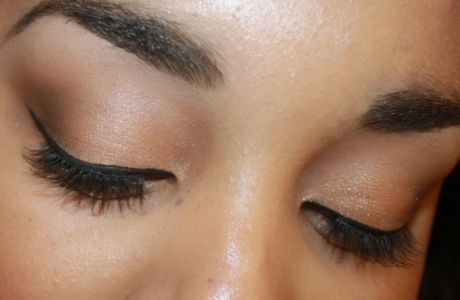 Add a dark brown eyeshadow on the third part of your eyelids. 5. 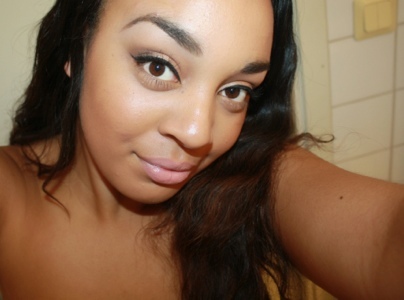 Blend out the dark brown eyeshadow, using a blending brush. 6. 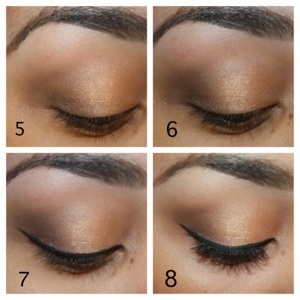 Add some more of the dark brown eyeshadow to deepen the outer corners of your eyes, and blend! 8. Put on some mascara or some false eyelashes. Add your face and lip products and you’re done! A super quick and easy summer look! I love the colour of this eyeshadow! Gorge! You just game me the ideal eye look for my everyday use! Thx girl! Hello Nicole and everyone,, wow, your makeup artist so amazed, specially the gold shade, I really love the way you apply and blend it to the eyelids, it make your eye brighter, dramatizer and of course your eyes looks prettier too. thumb up Nicole.